sc = modifybins(sc,PredictorName,Name,Value) manually modifies predictor bins for numeric predictors or categorical predictors using optional name-value pair arguments. 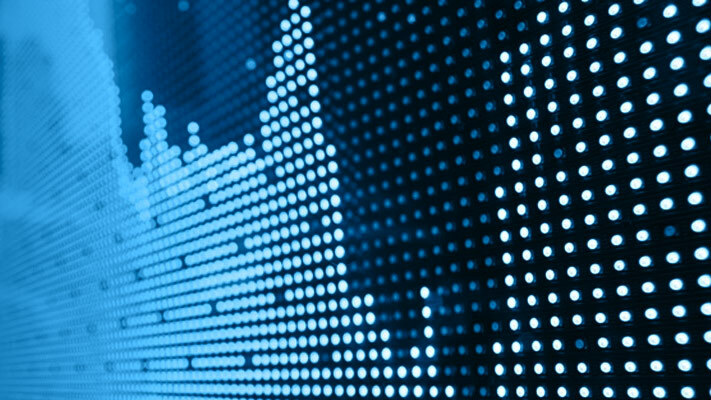 For numeric predictors, minimum value, maximum value, and cut points can be specified. For categorical predictors, category groupings can be specified. Bin labels can be specified for both types of predictors. The predictor CustIncome is numeric. By default, each value of a predictor is placed in a separate bin. Use modifybins to set a minimum value of 0, and cut points every 10000, from 20000 to 60000. Display updated bin information, including cut points. The first and last bins contain very few points. To merge the first bin into the second one, remove the first cut point. Similarly, to merge the last bin into the second-to-last one, remove the last cut point. Then use modifybins to update the scorecard, and display updated bin information. The binning map or rules for categorical data are summarized in a "category grouping" table, returned as an optional output. By default, each category is placed in a separate bin. Here is the information for the predictor ResStatus. To group categories 'Tenant' and 'Other', modify the category grouping table cg, so the bin number for 'Other' is the same as the bin number for 'Tenant'. Then use modifybins to update the scorecard. Display the updated bin information. Note that the bin labels has been updated and that the bin membership information is contained in the category grouping cg. Create a creditscorecard object (using a dataset from Refaat 2011). Use the modifybins function to merge the 2nd and 3rd bins. Display bin information for the categorical predictor ResStatus. Use the modifybins function to merge categories 2 and 3. Use the modifybins function to split the 2nd bin. Use the modifybins function to split bin 2 and put Other under bin 3. Use modifybins to reset the minimum value and create three bins for the predictor CustIncome and display updated bin information. Modify the bin labels and display updated bin information. Bin labels should be the last bin-modification step. 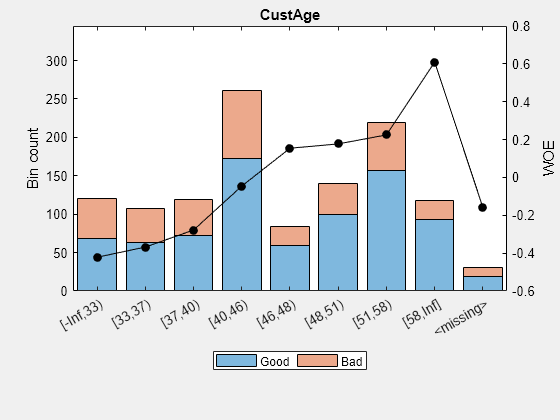 As in this example, user-defined bin labels often contain information about the cut points, minimum, or maximum values for numeric data, or information about category groupings for categorical data. To prevent situations where user-defined labels and cut points are inconsistent (and labels are misleading), the creditscorecard object overrides user-defined labels every time the bins are modified using modifybins. To illustrate modifybins overriding user-defined labels every time the bins are modified, reset the first cut point to 31000 and display updated bin information. Note that the bin labels are reset to their default format and accurately reflect the change in the cut points. Use creditscorecard with the name-value argument 'BinMissingData' set to true to bin the missing data in a separate bin. Display bin information for numeric data for 'CustAge' that includes missing data in a separate bin labelled <missing>. 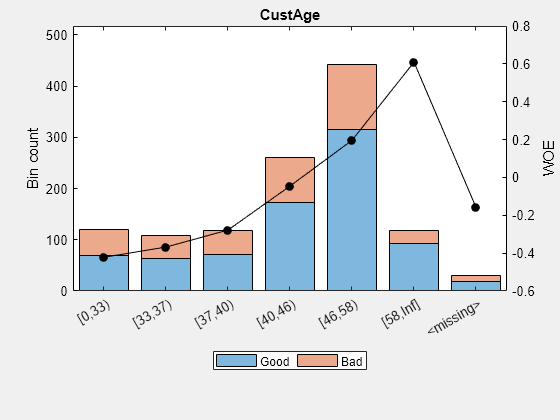 For the numeric predictor CustAge, remove cut points 48 and 51 and then use modifybins to define a 'MinValue'of 0 to manually change the binning and notice that this does not affect the data in the <missing> bin and the <missing> bin remains at the end. 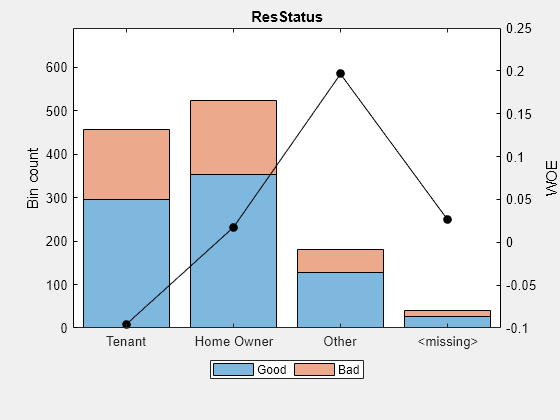 Display bin information for categorical data for 'ResStatus' that includes missing data in a separate bin labelled <missing>. For the categorical predictor ResStatus, use modifybins to manually merge 'HomeOwner' and 'Other' into a single group by assigning the same bin number to these categories. Notice that this does not affect the data in the <missing> bin and the <missing> bin remains at the end. Name of predictor, specified as a character vector containing the name of the predictor. PredictorName is case-sensitive. Minimum acceptable value, specified as the comma-separated pair consisting of 'MinValue' and a numeric value (for numeric predictors only). Values below this number are considered out of range. Maximum acceptable value, specified as the comma-separated pair consisting of 'MaxValue' and a numeric value (for numeric predictors only). Values above this number are considered out of range. The first bin includes any values >= MinValue, but < C1. The second bin includes any values >= C1, but < C2. The last bin includes any values >= Cn, and <= MaxValue. Cut points do not include MinValue or MaxValue. By default, cut points are defined so that each observed value of the predictor is placed in a separate bin. If the sorted observed values are V1, …, VM, the default cut points are V2, …, VM, which define M bins. Table with two columns named Category and BinNumber, specified as the comma-separated pair consisting of 'CatGrouping' and a table, where the first column contains an exhaustive list of categories for the predictor, and the second column contains the bin number to which each category belongs. By default, each category is placed in a separate bin. If the observed categories are 'Cat1'…,'CatM', the default category grouping is as follows. Bin labels for each bin, specified as the comma-separated pair consisting of 'BinLabels' and a cell array of character vectors with bin label names. 'BinLabels' does not support a value of <missing>. Bin labels are used to tag the bins in different object functions such as bininfo, plotbins, and displaypoints. A creditscorecard object automatically sets default bins whenever bins are modified. The default format for bin labels depends on the predictor’s type. Bin 1 contains 'Cat1' only and its bin label is set to 'Group1'. Bin 2 contains 'Cat2' and 'Cat3' and its bin label is set to 'Group2'. Using BinLabels should be the last step (if needed) in modifying bins. BinLabels definitions are overridden each time that the bins are modified using the modifybins or autobinning functions. Credit scorecard model, returned as an updated creditscorecard object. For more information on using the creditscorecard object, see creditscorecard.